WHEN a spiteful village hag on the Malaysian island of Langkawi maliciously spread the rumour that a beautiful young bride had been unfaithful to her new husband, she knew that if found guilty by the village elders it would mean the death penalty for the young beauty. And when those elders did ultimately order that the young bride, Mahsuri die by a blade plunged into her back, she beseeched the gods to wreak havoc on her island for seven generations in revenge for her wrongful death. And wreak havoc they did. Within day's of Mahsuri's death tidal waves swept away coastal villages and fishing ports, floods drowned crops, torrential rains collapsed mountain sides onto villages and gardens, then drought withered the ground and fishing boats sank unaccountably at their moorings. And raiding Siamese warriors plundered already depleted villages of their few remaining valuables. Then miraculously at the end of seven generations the havoc abated, and so that Mahsuri's beauty and her unjust death would be remembered for ever more, the gods transformed Langkawi into Malaysia's most beautiful islands – 99 dots of emerald green hills fringed by golden beaches set in a Hollywood-blue sea, and on which even the roads appear to sparkle. The Curse of Mahsuri goes back to a time none can put an exact date to, but which historians believe was probably around 1820. Mahsuri was the most beautiful girl in her village in Langkawi, whose islands lay off the north-west coast of Malaysia, and married a handsome warrior who spent much time away from home on matters of war. It was during one of these absences that a wandering salesman called at Mahsuri's home to sell her some cloth and haberdashery. The two became friends, Mahsuri delighted by the poetry he would recite on subsequent visits to her village and the traditional songs he would sing. One night Mahsuri invited him to stay for dinner, with her father as chaperone because of her husband's absence. When Mahsuri announced soon after that she was expecting a child, the jealous hag Mahura spread the rumour that Mahsuri was pregnant to the traveller. Acting purely on the word of the old woman, the village elders ordered Mahsuri's death – rejecting her father's pleas that he had chaperoned her on the night the traveller had dined with her, and despite her husband proudly proclaiming how their child looked exactly like he. As she was tied to a tree, Mahsuri beseeched of the gods: "If I am guilty of this thing, let red blood flow from my body; if I am innocent, let white blood mark this spot (and) there shall be no peace and prosperity on this island for a period of seven generations." Several attempts were made to slay Mahsuri, first with a sword and then by knife. Wounded by these failures and to get it over with, Mahsuri begged that her executioners use a razor-sharp family dagger to end her misery. But as the weapon was successfully plunged into her young body, the assembled villagers fell back in collective shock: white blood flowed into a great pool at Mahsuri's feet proving her innocence. Desperate attempts by the village medicine men failed to revive her, and she died in the arms of her sobbing husband soon after. Mahura was driven out of the village, but it was too late and within days the gods responded to Mahsuri's beseechment by wreaking their wrath on Langkawi. 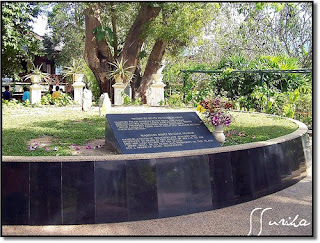 Many visitors to Langkawi pay a visit to Mahsuri's Mausoleum at Kampung Mawat about 15km out of the main township of Pekan Kuah; it contains Mahsuri's tomb, an aviary of local birds and peacocks representing peace and beauty, and a traditional house with a small museum. And visitors are smitten with the beauty that the gods bestowed on the island at the end of their seven generations of havoc... including roads that can sparkle as the sun shines on them. Is it because rubble from Langkawi's marble mines is mixed with the roadbase, or are those gods still reminding us of the beauty of the ill-fated Mahsuri? MAHSURI's Mausoleum outside the town of Pekan Kuah. 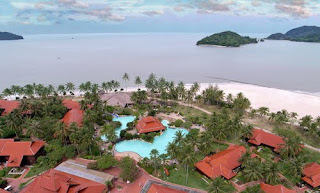 LANGKAWI's beaches are amongst the most beautiful in Malaysia. 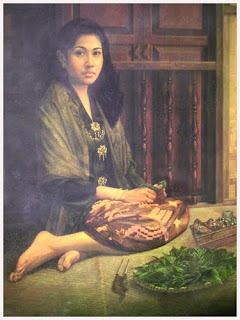 ONE of many artist's interpretations of the beautiful Mahsuri.